There are lots of furnace companies in Toronto for you to choose from, so where do you go? How about a company that is known as the go-to company for Toronto Furnaces? That’s what we will be focusing in on today, the company called AC Furnace GTA. As you can tell from their name, they do Air condition, furnaces and more in Toronto. Furnaces can break and need to be repaired or replaced, and it’s always great to have somebody on call that really knows what they are doing. AC Furnace GTA doesn’t just repair Toronto furnaces, they also sell them flat out. If your furnace is old or if you’re a contractor putting furnaces into a house then you should talk to these guys for sure. Another very popular option with these guys is the $26.95 rent to own program where you don’t have to actually buy the furnace but you can rent a furnace from them anywhere in Toronto. It’s certainly a great option for anybody in a current financial bind! 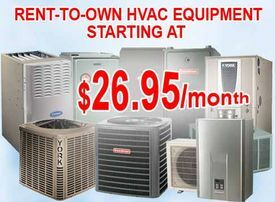 This rent to own program is different then the actual rent a furnace offered by AC and Furnace GTA.com. The other option for your Toronto furnace is to straight up rent it for $59.99 a month from these guys. If you are looking for a Toronto furnace repair, sale or rental company, look no further than AC Furnace GTA.